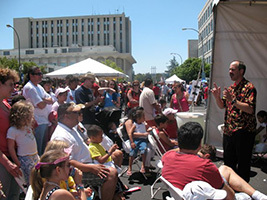 Over 10,000 people appeared on Saturday at the Redwood City 4th of July Celebration. This was my 4th year and you can expect to see me there again next year. Lots of food, music, arts and crafts and more food all day. The weather was not too hot, so my rabbit, Rocky was quite pleased about that. I had one of my ‘fans’ take some photos and here are a few. I did 4 shows and included several kids in many of my routines. My favorite is FUZZ BALL. You can see a version of this on my youtube channel that I did for Scotts Valley High School Grad Night.